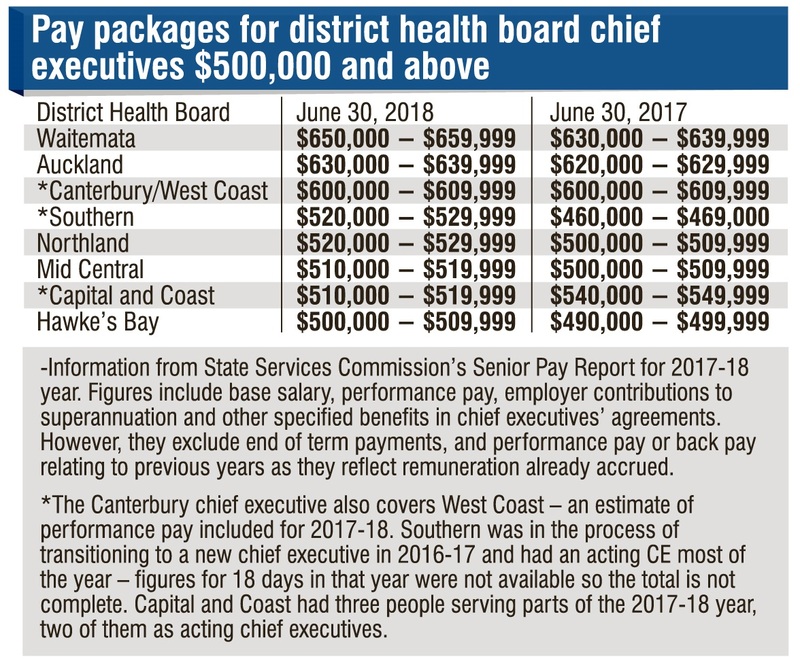 Eight district health boards had pay packages for their chief executives of $500,000 or more last financial year. Figures released in the State Services Commission’s Senior Pay Report for the 2017-18 financial year show only two chief executives, Canterbury’s David Meates, and Bay of Plenty’s Helen Mason, had packages which remained unchanged. All other packages had increased. In the case of Mr Meates, who fulfils the chief executive’s role for both the Canterbury and West Coast boards, his 2017-18 remuneration of $600,000 to $609,999 was an estimate as his performance pay had not been finalised. Ms Mason’s package was listed in the band $470,000 to $479,999. The highest package went to Waitemata DHB chief executive Dr Dale Bramley at $650,000 to $659,000. His previous package, which included a job sizing amount related to an earlier time, was in a band $20,000 below this ($630,00 to $639,999.) The Waitemata board serves the largest population of the country’s 20 DHBs, covering 620,300 people. Packages for Southern’s Chris Fleming and Northland’s Dr Nick Chamberlain were fourth-equal highest on the list, in the band $520,000 to $529,999. The smallest remuneration packages in the band $330,00 to $339,999 were at South Canterbury (Nigel Trainor) and Wairarapa DHB (Adri Isbister). Wairarapa is the board serving the second-smallest population (45,000 people) and South Canterbury the fourth-smallest (59,900). It appears Mr. Fleming has taken less pay than his predecessor Carole Heatly at a time of increasing pressure caused by him having to rectify her mistakes.